SHARON, Mass. 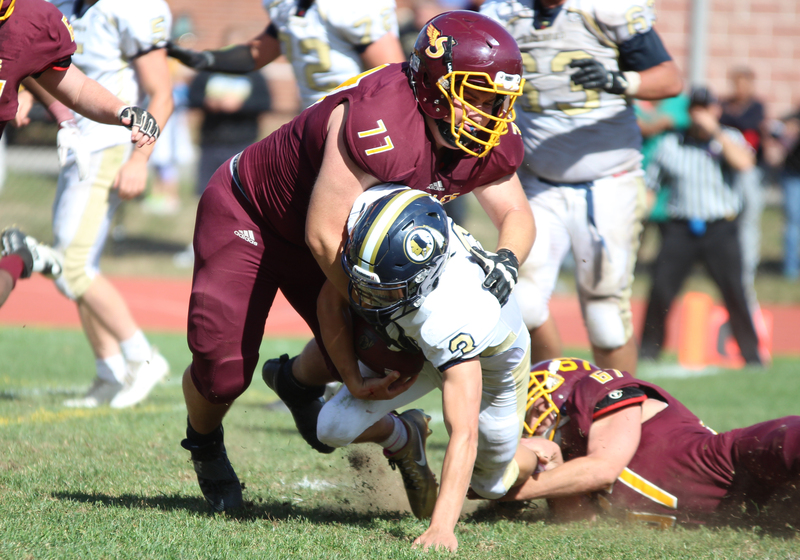 – Sharon scored a pair of touchdowns in the third quarter and denied a late two-point conversion attempt from Foxboro to hold on for a 14-12 win on Saturday afternoon. 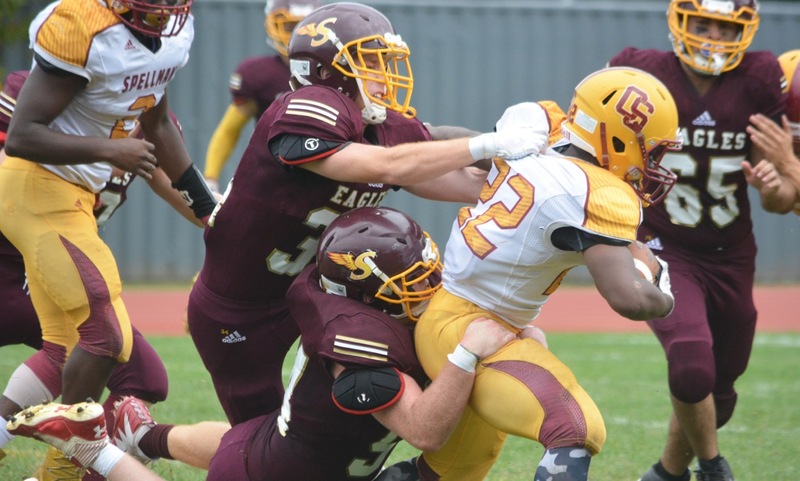 After a scoreless first half, the Eagles scored on a pair of runs in the third quarter. Foxboro responded with two touchdowns in the fourth quarter but saw their two-point attempt with 1:41 come up short as Sharon moved to 3-0 on the season. Sharon senior Juvan Elisma proved to be a big difference maker, rushing for 186 yards on 23 carries. All four of Sharon’s drives in the first half ended with punts, including their second drive that spanned 52 yards on seven plays. But even as the Eagles’ offense stalled, their defense was strong and kept Foxboro at bay. The Warriors punted on their first drive, missed a 43-yard field goal on their second drive, fumbled possession away on the third drive and their late drive in the second quarter ended with an interception. Foxboro was set to receive the opening kickoff of the season half, but a bouncing kick was muffed and Sharon junior Brett Litner emerged with the ball at the Warriors’ 43 yard line. Sharon moved the sticks right away with a 12 yard run from Elisma and three plays later, quarterback Drew Naisuler used a sneak to move the chains again. Back to back runs from Elisma moved the ball to the 5 yard line and Xavier Hackett ran it down to the 1 yard line. Naisuler kept it again for a touchdown, putting Sharon up 6-0. The two-point conversion was stuffed but Sharon had a lead with 7:17 left in the third. “[The recovery] wasn’t by design but that’s basically six points you pull out of nowhere,” Morse admitted. The Eagles forced a three and out on Foxboro’s first possession of the second half and then rattled of its longest drive of the game. Sharon used nine plays to cover 58 yards to find the end zone again. Elisma moved the chains with a 14 yard gain and then Naisuler connected with Austin Dodes for a 15 yard reception. Elisma converted a fourth down with a six yard rush, getting Sharon inside the 10 yard line. Elisma went for four more yards and Naisuler used a QB draw to dive up the middle for a 3 yard touchdown. Elisma took the handoff and plunged into the end zone for the two point conversion, putting Sharon up 14-0 with 1:54 left in the third quarter. Foxboro was finally able to get its offense in gear on its second drive of the final quarter. After punting on its first drive, the Warriors used a 12-play, 72-yard drive to get on the board over halfway through the fourth quarter. Senior Mark Clagg hit Trey Guerrini for a 17 yard reception to start the drive and Anthony Capachietti converted a 3rd and 2 just before midfield. Clagg hit Jamaine Few on third down for 8 yards to move the chains and then hit Phil Dure for 15 more yards. On 2nd and goal from the four, Capachietti darted up the middle for a touchdown. Foxboro’s extra point was wide as Sharon had a 14-6 advantage with 3:25 to go. After a touchback, Sharon was facing a 3rd and 5 from its own 25 yard line. Elisma looked like he iced the game, getting around the edge and sprinting ahead for a 42 yard gain. But on the next play, an option resulted in a fumble and Foxboro recovered with 2:16 left. On second down, Clagg his Capachietti for a circus 18 yard gain, catching in the flat on the left side before racing back across to the right sideline. On the next play, Clagg bought some time in the pocket and then found a wide open Devin Hassett downfield for a 47 yard touchdown with 1:41 to play. Clagg completed his pass on the two point attempt but Sharon’s defense kept the ball out of the end zone to preserve a two point lead. On the onside kick attempt, Naisuler came away the recovery. Elisma ran for 10 yards on second down to move the chains and from there, Sharon was able to kill the clock with kneel downs. The Eagles had plenty of players make contributions on both sides of the ball. 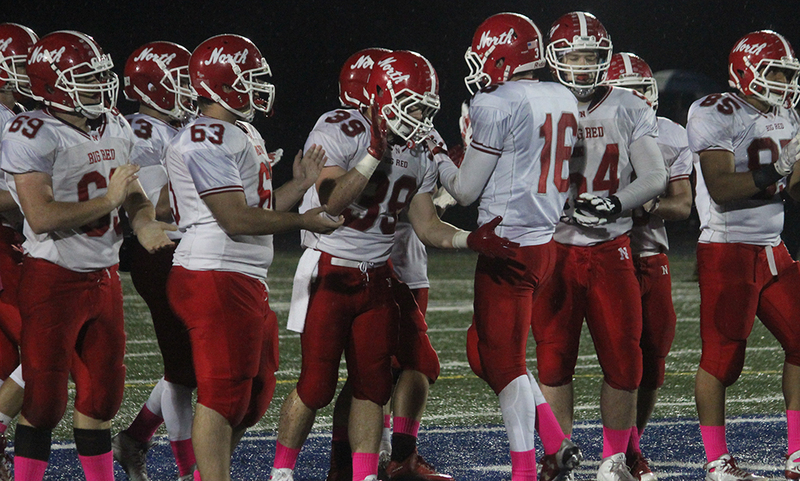 Naisuler, the quarterback, recovered a fumble and handled the onside kick. Dodes had a pair of catches on offense and an interception on defense. Senior Nate Hirsh was not only a big factor on both the offensive and defensive lines, he had a strong day punting, averaging nearly 40 yards per punt and a long of 58 yards. Foxboro had the advantage in yards (299-240) and held Sharon to a poor third down conversion rate, but three turnovers hurt immensely. 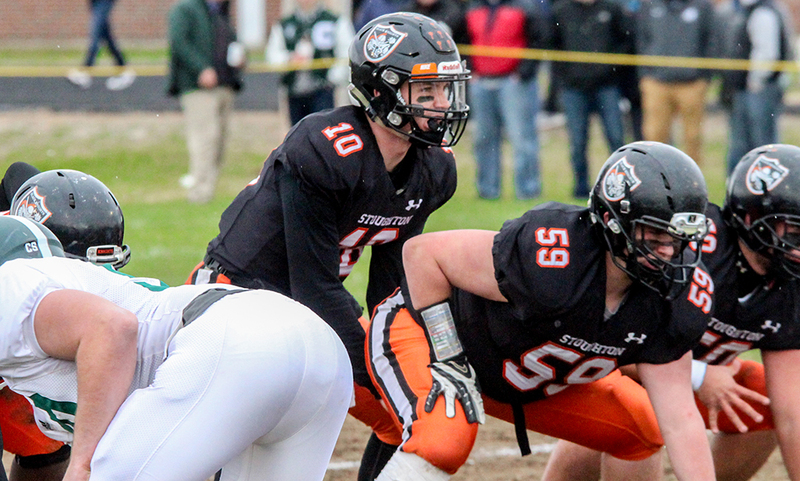 “[Sharon] played great, you can’t take anything away from them,” Foxboro head coach Jack Martinelli said. “But you just can’t play seven minutes out of 44 and expect to win a game. [Elisma] was tough today, he ran good. It’s been kind of a sore spot for us this year on the edge. While Sharon nearly gave up its lead in the fourth quarter, Morse was happy that his young squad was able to make just enough plays to hold on. Sharon football (3-0, 1-0) will try to remain unbeaten when they host Stoughton on Saturday while Foxboro (1-2, 0-1) will host Canton on Friday night at the Ahern Middle School.